Discover Leuven. Saint Peter's Church in the Center of Leuven. Saint Peter's Church in Leuven, Belgium. Saint Peter's church is open every day of the year. However, visiting hours vary from day to day. You can play it safe, by going between 10 A.M. and 4 P.M. from tuesday to saterday. On sundays the church is open between 2 and 5 P.M. On mondays the church is open only from 15 March till 15 October. Construction of the present Gothic Saint Peter's church was begun approximately in 1425, and was continued for more than half a century. Its construction period overlapped with that of the Town Hall, and shared the same architects as its neighbor. Plans in the early sixteenth century called for the erection of three colossal towers surmounted by spires. One of the towers would have been the tallest building of its time. However, these plans had to be abandoned because of insufficient ground stability, and after partial collapses occurred. Now, the main tower just rised above the church roof. 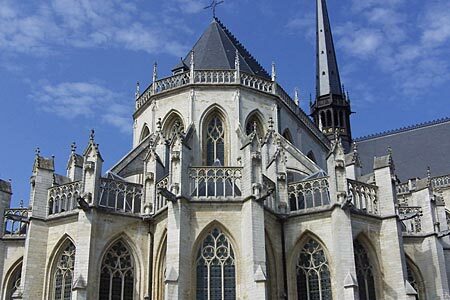 Saint Peter's church is not the only church in Flandres, that did not reach its intended height. One could say that quite a few churchbuilders suffered from the Icarus syndrome. Despite damage during the two World Wars, the church remains rich in works of art. The chancel and ambulatory have been turned into a museum in 1998, with a collection of sculptures, paintings and metalwork. 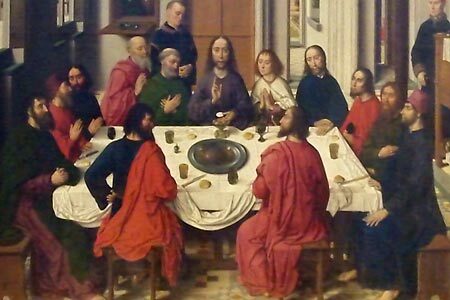 Outstanding are two paintings by the Flemish Primitive Dirk Bouts : the Last Supper (1464-1468) and the Martyrdom of St Erasmus (1465), the latter now under restoration. 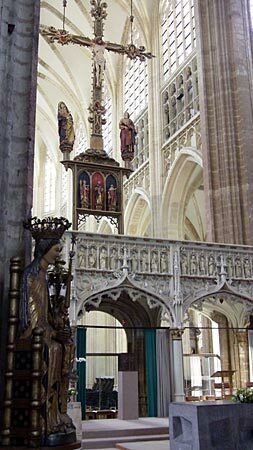 Other artworks of interest are the tabernacle, an elaborate oak pulpit and the sculpture of Madonna and Child by Nicolaas de Bruyne, which theme is still used as the emblem of the Catholic University of Leuven.